Doomsday Book Blu-ray Review Doomsday Book is still a cogent and satisfyingly creepy exploration of a perennial theme and further proof, if proof be needed, that the Koreans are the undisputed masters of present day Pan-Asian cinema. Despite its seemingly sinister title, the original Doomsday Book (or Domesday Book to use the archaic spelling) was nothing more than a comprehensive 1086 British census and land survey, famous for being the earliest surviving public record of its type. The project took on the seemingly tongue-in-cheek appellation ‘Doomsday’ due to the fact its contents were so comprehensive as to be comparable to the information that would be obtained by Christ during the Final Judgement. OK? That’s the history lesson out of the way. 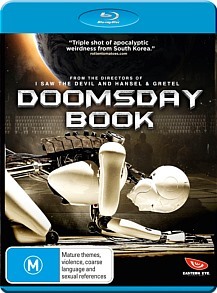 This Doomsday Book is a triptych of short films by two of South Korea’s most renowned directors, namely Kim Ji-woon (The Good, the Bad, the Weird) and Yim Pil-sung, creator of the masterful and criminally overlooked 2007 horror-thriller Hansel and Gretel. Connected thematically if not by narrative, each of these three apocalyptic stories takes a unique view of the end of the world. The blackly humorous first section, ‘Brave New World,’ was directed by Yim and depicts Korea as ground zero for a global zombie pandemic that is unwittingly started by unlucky in love scientist Seok-woo, whose quest for romance is further hampered when he ends up inadvertently poisoning his date (The Chaser’s stunning Ko Joon-he). The second film, helmed by Kim, is a glossily high-tech musing on the nature of artificial intelligence entitled ‘Heavenly Creature’ that is everything I, Robot should have been and depicts the director at the top of his game. Finally we have the closing instalment, ‘Happy Birthday,’ a loose collaboration between both directors which is the probably the most out-there of the three sections, focusing on a giant asteroid-sized 8-ball making its way towards the planet. By turns funny, zany and frightening, Doomsday Book blends brevity with social conscience and constitutes a clever and compelling turn from these two immensely talented directors. For short films the segments aren’t particularly short, running an average of 40 minutes each and exploring their respective themes and subject matter in an impressive amount of detail. While it may not reach the heights of the directors’ previous films like A Bittersweet Life and I Saw the Devil, Doomsday Book is still a cogent and satisfyingly creepy exploration of a perennial theme and further proof, if proof be needed, that the Koreans are the undisputed masters of present day Pan-Asian cinema. Just a handful of Eastern Eye Trailers (including one for the peerless Korean film Bedevilled), though the feature’s 2-hour running time doesn’t exactly leave you feeling short changed.